Posted on January 17, 2019 January 17, 2019 by SherylPosted in FoodTagged recipes. My dad used to make a hot rum punch in the winter from a recipe he said he got from one of his father’s friends. I can’t date it, but it surely was from this period. I loved it. It was basically a sugar syrup cooked with stick cinnamon and whole cloves, fresh orange and lemon juice, and a quart of rum. We’d make it, fill Mason jars with it, and stick it in the refrigerator. Anyone who was chilled from skating or shoveling was free to heat up a cupful. Except for the fact that this punch contains no apple cider (and I’m probably making a leap that goes too far), this punch reminds me of some of the hot spiced cider drinks that are served around the holidays. I noted the centennial of Prohibition, and that it wasn’t unpopular when passed, on my blog on January 16 ( https://lexanteinternet.blogspot.com/2019/01/wyoming-north-carolina-utah-nebraska.html ). One of the things you note here was indeed very much the case. No matter what people want to believe, Prohibition was hugely popular in the U.S. at the time that the 18th Amendment became law. One of the things that Prohibition caused, according to folks who’ve studied it, was to decrease the quality of American alcohol, due to it becoming illegal and because of people’s willingness to substitute poor quality and even dangerous substitutes, that when Prohibition ended some 12 years later a lot of good American spirits didn’t return and the quality of American beer decreased for decades. One casualty of Prohibition, apparently, were cocktails. Supposedly the years leading up to Prohibition, before it became inevitable that it would pass, was the golden age of cocktails and they’ve never returned to the quality they once were. Indeed, on odd occasion I’ll attempt to order a cocktail that was very popular right at this time and find that a lot of bartenders have never heard of it, even though it was once huge. Most brewers and distillers in the U.S. went out of business during the years of prohibition, so it makes sense that it took a long time for the quality to come back. Probably many of the old recipes and processes were lost forever. As a followup, it’s interesting that the recipe called for “good whiskey”. Whiskeys, like beers, have enjoyed an enormous come back in recent years so I’d guess that a recipe now would be more specific, as in “bourbon”, etc. My guess is that this recipe is for bourbon, but it’s interesting that it didn’t actually say that. Maybe at the time whiskey was always bourbon in the U.S., and if you wanted something else like Rye Whiskey or Scotch you had to say so. I tend to associate bourbon with Kentucky. 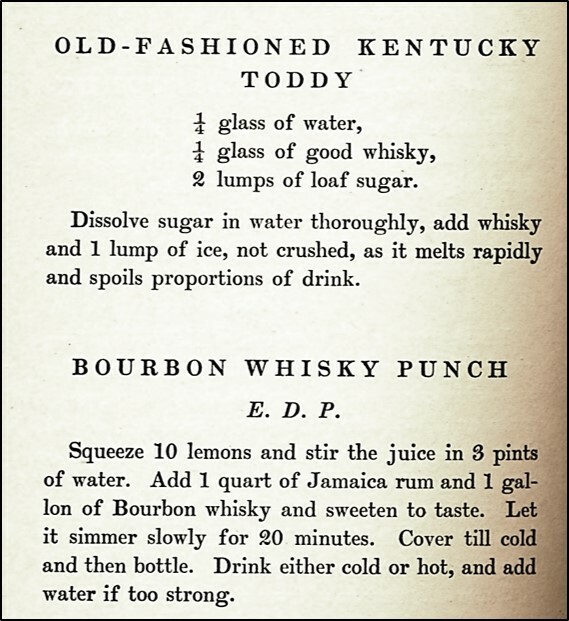 Given that this cookbook contained recipes from Kentucky, I’d also guess that the recipe is for bourbon. Hahaha. Just read Pat H’s comment above about whiskey was always bourbon. I don’t drink either, but the taste of bourbon I don’t care for, so I don’t have much knowledge. It’s interesting to me to read about these alcoholic beverages. I’m not a teetotaler but bourbon isn’t my favorite either. Indeed, for the most part, I flat out don’t like it. Like a lot of things, I suppose, it must be an acquired taste (which begs the question of how you go about acquiring it). Some bourbons make good cocktails, unless they’re made by me. I can’t mix a drink at all. I am not very good at it either! I don’t even like bourbon-flavored candy or desserts. Maybe if I grew up in Kentucky?! One of our family stories is that my grandparents (French Canadian by birth) would travel back to Canada to “visit family.” Well, they always returned with cases of Canadian Club whiskey and other spirits which they distributed to family and friends back at home in Vermont. Local police often got a little gift of liquid gold for turning a blind eye to it all. I actually have one of my grandmother’s little notebooks with lists of liquor! What’s forgotten about that is that most of the Canadian provinces enacted Prohibition on a provincial level starting in the 1870s and carrying through World War One. During the Great War, the Canadian Federal Government adopted it as a wartime measure, but it expired at the end of the war. Nonetheless, by that time most Canadian provinces had enacted it, but Quebec, with its French population, was an exception. My mother was from Quebec and her younger brother told me a couple of years ago that when he moved from Montreal to Toronto in the early 50s he told his wife that the company was making them move, rather than admitting that he accepted a promotion, as Montreal was a lively city at the time (and still is) but Toronto was not and was quite conservative in every fashion at the time. Wow – I’m amazed how early some Canadian provinces enacted prohibition. I know that some U.S. states had prohibition prior to the federal amendment. Now I’m curious about when the first U.S. states implemented prohibition. What a fun story! You are very fortunate to have your gradmother’s notebooks. The notebook is a child’s theme book with poetry transcribed in French in the front. In the back pages are the lists of liquor. I’m not sure if she was being frugal in reusing the notebook, or trying to hide what she was doing??? What an intriguing combination of items in the notebook! Your grandmother sounds like an interesting person. That punch is way too strong for me! You remind me that I have a handwritten little notebook from the 1920s in which recipes for alcoholic beverages were written. It’s kind of trippy to see what people drank back then. That’d be really interesting, as if you are in the U.S., the entire 1920s was during Prohibition. Yes, I need to find that little notebook. It’s around here somewhere. I remember glancing through it while we clearing out my mother’s house, but I couldn’t tell you off the top of my head what drinks were listed in it. I’m bemused by the fact that alcohol was forbidden but it was ok to give to sick people! It is odd, but alcohol remains a pretty common constituents to suspend some medications. Up until relatively recently it was thought a good medication for some things and its surprising how long it remained in medical kits, to include veterinary kits. One of the treatments in the British Army of this period for colic in horses (which is pretty serious) was beer, and at about the gallon or so dosage. FWIW, when I was a kid, if I was pretty sick, my parents would give me a little Canadian whiskey laced with a lot of sugar. This was a very small dose of whiskey. I don’t know if it had any medicinal effect at all, but I believed it did. Later on, I learned that this was very common at the time and most children my age had parents that did that. Not only is your post interesting but all of the comments add to making it even more so. It’s nice to hear that you enjoyed this post and the comments. I am so fortunate to have wonderful readers who are willing to share their knowledge. I’m constantly learning new things from readers’ comments.